Avenged Sevenfold News: M.Shadows: "Honestly I have seen a lot of people play test this game and..."
M.Shadows: "Honestly I have seen a lot of people play test this game and..."
FAN: I'm the worst when it comes to playing video games and I get really competitive and angry if I lose(I one threw my phone against the wall when I lost...:3). So seeing that I'm not much of a gamer, is that gonna effect my chances of actually finishing the game!?? 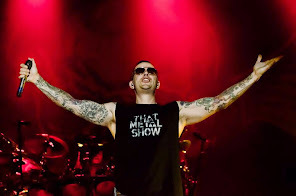 M.Shadows: Honestly I have seen a lot of people play test this game and for non gamers it seems hard. But for most of you who seem to be big time gamers, it's not so bad. Mostly you just have to get used to the controls. Using a virtual D-pad isn't always the standard or easiest thing to get used to but its def. possible. I have mastered it so I'm sure you all can too with a little big of practice.